Nami (Miyuki Ono) is a host for a late television program that shows crazy videos sent in by viewers. The show receives a tape that appears to show a gruesome drawn out murder, and a message that Nami is to be the next victim. Insanely, she decides to drag a camera crew out to an abandoned factory where the murder may have happened. Once there, they begin to explore the place, but one by one each of them starts falling victim to elaborate and extremely sadistic traps. Nothing will prepare Nami for when she discovers who or what is behind it all. 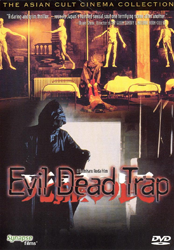 Evil Dead Trap is a grimy and extremely low budget homage to the Italian giallo, with just a taste of of Sam Rami and John Carpenter’s films. All of which is distorted through the particularly weird lens of Japanese horror. The story begins intriguingly, but I have a very difficult time believing Nami is the kind of person who would rush headlong into a death threat just for the sake of her show. The actual effects are cheap but they work well enough, and there is definite cruel edge to fate of anyone dumb enough to walk into the factory. The warehouse setting, prerecorded videos, and use of traps makes me wonder if this film had any influence on Saw (2004). The final reveal of the killer is so out of left field it basically turns the third act into another film entirely. Make no doubt about it, Evil Dead Trap is ridiculous, but it's also a refreshingly unique mash-up of horror sub-genres.